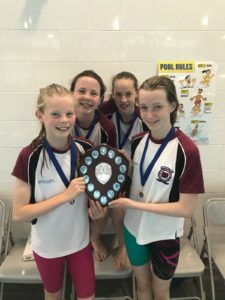 Emilie Paul, Heather Doney, Chloe Milburn, Olivia Murray and Kirsty Carruthers won the overall girls 8/9 team title. Emilie, Heather, Chloe and Olivia are here with their trophy and coach Angus Johnston. 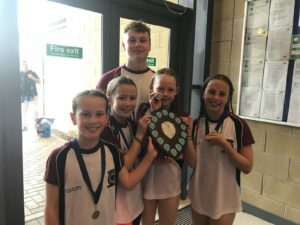 In the girls 12/13 age group the team of Alice Mackie, Olivia Dean, Sophie Milburn, Katie Macdonald and Lizzie Whike picked up the trophy. 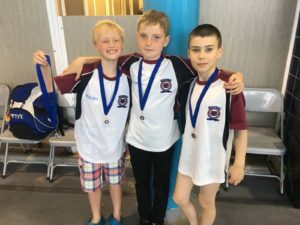 The boys 8/9 team of Lewis Robb, Charlie Brown, Kier Strormonth, Anton Skornyakov and Jack Robertson came third in their category.